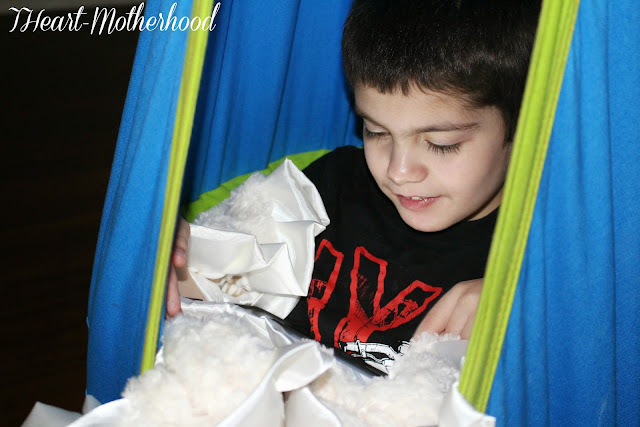 My children love to cuddle, they love snuggling up on the couch watching movies or just relaxing with a good book. Majority of the time, they are wrapped up in their favorite blanket, both of my kids own quite a few blankets but they each have their own "favorite". That favorite goes everywhere, in the car, on the couch, to grandma's, etc. Well thanks to Minky Couture, we ALL have a new favorite blanket in our house, we can't get enough of our brand new designer blanket! Minky Couture was established in 2009 by Sandi Hendry, she enjoyed creating gifts to give & soon started designing cozy, soft blankets with the wonderful minky fabric. At Minky Couture all of the blankets are made right here in the USA! You will find a wide variety of colors & styles like chevron print, Damask, sports prints, satin, Moroccan & many more! Everyone in your home needs a Minky Couture blanket & they have just the perfect size's too! Ranging from infant size (36X30) to Monster Minky (60X72), you will have no problem shopping for a blanket in your desired size! Little Sister C has had her heart set on a minky blanket for quite some time, but I didn't just want to pick out any minky blanket, I wanted her to have one that would last a life time. A blanket that was super soft, beautiful & durable - that's exactly what I found when a package from Minky Couture arrived at our house! I quickly fell in love with many of the blankets featured online at Minky Couture & I would own them all if I could! The Jaclyn-Cream-Cream features off white & tan Damask print with cream swirl back & a cream ruffle! This tween sized blanket is perfect for my daughter, she could not get over how soft it was, the design is absolutely stunning & it's beautifully made. Little Sister C hasn't put her blanket down since the day it arrived, although she was kind enough to share with her Big Brother one afternoon & he also loved how soft it was! Any of the blankets at Minky Couture would make an amazing gift for that special someone, a newborn baby, a child's birthday, the possibilities are endless! You can also take it a step further & customize your blanket with embroidery! Be sure to check out the customize-able options, pricing, fonts & more online at Minky Couture! So what do you think? Which beautiful blanket would you love to have in your home? Connect: Follow Minky Couture on Facebook, Twitter, Pinterest & Instagram! 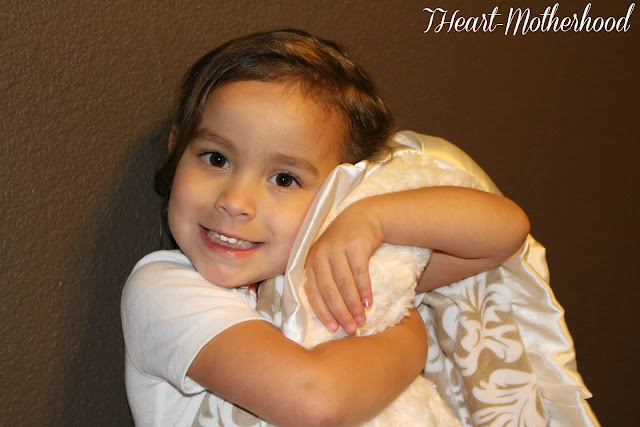 Buy it: You can purchase the Jaclyn-Cream-Cream Tween size blanket online at Minky Couture! Use coupon code review40 to save 40% when making a purchase from Minky Couture! 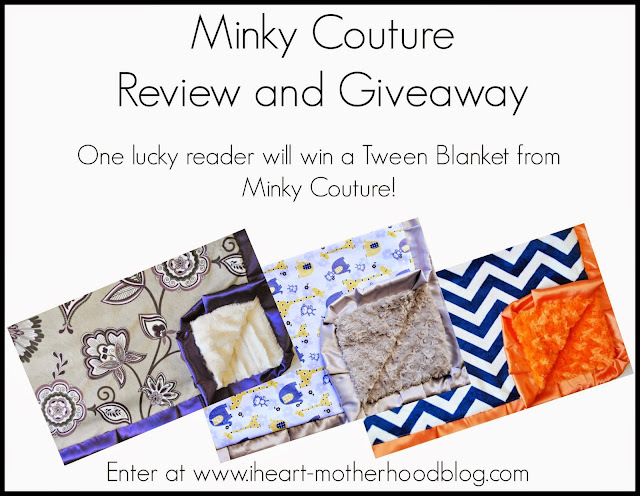 Disclosure: This giveaway is sponsored by Minky Couture. IHeart-Motherhood is not responsible for prize fulfillment. This giveaway is not affiliated with Facebook, Twitter, Google+, Pinterest or Instagram. This giveaway will end 6-9-15. Giveaway is open to anyone in the US, 18+ & older. Winners will be posted via Giveaway Tools. No purchase is necessary & void where prohibited by law! My favorite is the Chevy Multi Charcoal & Navy-Charcoal-Charcoal adult blanket. I like the Honeycomb Slate-Charcoal-Black!! I love the Pink Damask and hot pink blanket. Love all the personal reviews now I want one for myself! My favorite is the Toffee Toffee - no ruffle! My favorite pattern is the Jaclyn Sterling-Silver-Dark Teal. I love the Crabby, Flight and Diamond Royal prints! So adorable! I love the Chevy Multi Pink and Silver-Pink-Silver! I like the Baze Charcoal Red robot print blanket! 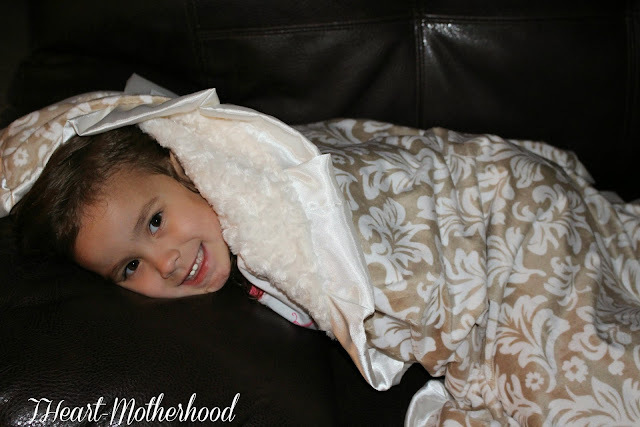 Love the adorable Animal Cracker-Silver-Silver blanket!